Flame-haired Florence Welch is one of the strongest talents to come out of England in the past few years. Her voice is a powerful force, capable of great soul and delicacy within moments. 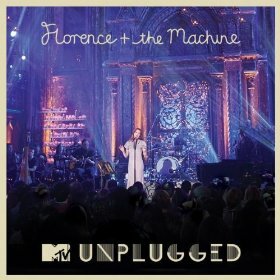 As such, the “unplugged” setting provided by MTV showcases how her voice is the central element of all her music. However, the presentation creates a bit of a dilemma. Welch herself is the central part of the band, with the members shifting along the way. As such, the instrumentation has never been as important to the songs as the lyrics and vocals. The addition of a choir does add something to some songs, such as “Never Let Me Go” and “Dog Days Are Over,” while the sparseness of “Try a Little Tenderness” does prove Welch’s impressive singing chops. For me, the highlight of this record is a cover of “Jackson” with Queens of the Stone Age’s Josh Homme channeling Johnny Cash rather well. This song is one of the few that pushes Welch out of her comfort zone, throwing her into country territory. Had the band experimented more with covers or rearranging their music, this could have been an extraordinary album and an opportunity to reach new fans. As it stands, it’s just your run-of-the-mill live album with all of the applause and none of the banter that might make a show memorable.